VETERAN marathon runners Cresenciano and Gerald Sabal finished first as a team, in the Second International Mount Apo Boulder Face Challenge in Davao del Sur over the weekend. Soldiers of the Philippine Army, the brothers Sabal with logistics crew Jhanalodin Lucman representing Team Bebang clocked 15:38:33 as they crossed the finish line at 7:02 a.m. on Sunday, beating last year’s record of 22:51:42. They won a cash prize of P150,000. 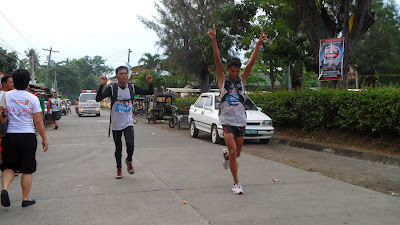 Cresenciano is a three-time Milo Marathon champion, while Gerald also regularly joins marathons. Both were in the CamSur Marathon last year, a qualifier for the Boston Marathon. Last year’s champion, Team Carmen of Davao del Norte, came in second with a time of 15:59:18. Composed of P01 Jonathan Pido, Ronald Dagaang, Edwin Bueno, the team won P100,000. The team was first to reach the summit of Mount Apo at 3 p.m. on Saturday, but a slight injury suffered by Dagaang may have slowed them down, according to race organizers. In third place was Team Apo Ville from Digos, Davao del Sur, composed of Marcial Catanggui, Romeo Mascardo Jr. and Hilario Ladra, which clocked in at 17:12:58. The Mount Apo Boulder Face Challenge is a 24-hour extreme challenge using various disciplines such as mountain biking, trekking, water tubing and road running. The race covers a distance 90.3 km, including the 10,000-feet elevation of Mount Apo, and as such it is considered one of the toughest adventure races in the country. In an interview with the BusinessMirror, Arturo Boncato Jr., regional director for the Department of Tourism-Davao, said this year’s race attracted 13 foreign and 35 local teams. Some of the racers come from Australia, Hong Kong, Singapore, Vietnam and Indonesia. Last year, the first time the race went international, there were only 18 local and foreign teams which participated. But it was the Filipinos who dominated the race. Team Champion Systems Adventure from Hong Kong composed of an Australian, an American, with a Filipino logistics crew was the first foreign team that made it through the finish line. They placed fifth in the race after Team DOTA, also Filipinos, from Davao City. Fourth-place to eighth-place finishers get P10,000 for their effort. Still, according to Boncato, “this is the biggest set of prizes among adventure races in the Philippines.” DOT-Davao co-organized the race with the municipal government of Sta. Cruz, Davao del Sur. The Mount Apo Boulder Face Challenge was started in 2008 and is one of the highlights of the annual Pista sa Kinaiyahan (Feast of the Environment) of the municipality. The race kicked off at 6 a.m. on Saturday with a mountain-bike race starting from the municipal plaza. After the biking leg, racers had to scale the boulder face of Mount Apo, whose peak was first reached at 3 p.m. by Team Carmen. However, on the way down from the summit, they were overtaken by Team Bebang which reached the Sibulan pit stop at 9:30 p.m. The race resumed at 5:30 a.m. on Sunday, with a water tube ride down the river, then running back on foot toward the finish line at the municipal plaza. Boncato said the annual race has made the Davao region a leading destination for eco-adventure tourism. It has also helped increase awareness about the importance of protecting the environment. Mount Apo, an active volcano, was declared a national park in 1936 and a protected area in 2004. It is home to the Philippine eagle, and hundreds of other critically endangered bird and plant species. The national park is on the tentative list of the United Nations Educational, Scientific and Cultural Organization (Unesco) as a Heritage Site. At 10,000 feet, it is considered the highest mountain in the Philippines. Data from the Sta. Cruz municipal government showed 923 climbed Mount Apo using the Sta. Cruz trail in 2011, up 19 percent from 2010. There are two other major trails going up the mountain’s summit from the North Cotobato side. The 2nd International Mount Apo Boulder Face Challenge was also supported by the Department of Environment and Natural Resources-Region 11, Department of Trade and Industry-Davao del Sur, San Miguel Corp., Aboitiz Power Corp.-Hedcor Sibulan Inc.; Columbia Sportswear Co., Primer Group of Companies, Recreational Outdoor Exchange, and Zest Air.